If you're reading this article, you've probably already heard about Facebook and Twitter. What you might not realize is that the Internet is a treasure trove of budding social media sites that are harnessing the power of crowd sourcing to answer questions, solve problems, and build innovations. I could write forever about social media and still miss a ton of amazing sites, but the two below are worth checking out. Naming conventions aside, I'm pretty fond of Softcity. I found out about the site from one of its main contributors Eileen Brown, after she referenced one of my articles there. It's a software review/purchase site driven completely by user contributions. You can also gain discounts on the software for contributions you make, so you can get something tangible for your effort. 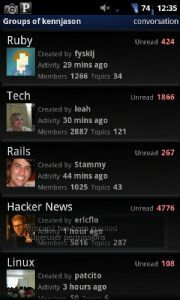 Thus far I've only taken part in one or two discussions, but the sheer amount of user added input is pretty staggering. You can ask pretty much anything (within the scope of the site, of course!) and have a plethora of replies in short order. With featured developers, software discounts and other services, Softcity is a great resource when you need an experienced viewpoint on a topic or you want to impart the same. The Internet is out there, just waiting to answer every question you could ever ask, and willing to pick your brain to get that answer. Go ahead and let it happen. I'm an avid fan of Hacker News, so when an HN user posted about the creation of Convore, I jumped on-board. Convore is a site based on creating themed groups, inside of which you can start a conversation about related topics. There's also an app for iOS and Android devices. You follow selected groups (as seen in the screenshot), and are alerted to the conversations that take place within them. My example highlights my relatively nerdy interests, but you can use the Discover button to see what your friends like, or the search function to find just about anything you want to view or participate in. Many social media sites are turning to crowd sourcing for services and Convore seems to have garnered the attention of the HN community, making it a powerful force for ideas and innovation. When I opened my account there, I made the mistake of setting it up so I received email notifications of updates to threads I followed and new topics being created. Hello hundreds of emails a day! I now run the summary once a day; as you can see from the picture, it can get crazy. Sites like Convore are the future of social media crowdsourcing. It works as a news aggregate as well as a question/answer forum for its myriad of topics since you can post anything in the groups. Hacker News is pretty much start up central, so as a knowledge base this is hard to beat. When Jason isn't on the Internet, he's - wait, who are we kidding? Jason's always on the Internet. Follow him on Twitter @kennjason.